I’m just a girl who decided to change her life and apparently that kind of stuff inspires others. Who knew?! I mean, I did know this because I’ve got a whole roster of people whose influences on me would read like a Sonnet were I to sing their praises here, so I know how the cycle of inspiration works and when I’m not stopping dead in my tracks at the notion I’ve somehow ignited a spark for change in someone else, I’m truly quite honoured to be listed among the influential because when I think of those who have inspired me, I think of these wildly cool, strong individuals who have magnificent, impactful lives. Nothing wrong with being lumped in with the same, I don’t think; in fact, I feel proud that living out loud, which I define as anything that isn’t hiding, has encouraged others to do the same. The difference of two years. Living out loud doesn’t have to be transformative work like the kind I have embarked on in the last two years, it can be anything. Take Constance Hall, for instance, who is sharing and blogging about how the struggle is real with mum tums and diapers. A Queen, she’s self-professed with the support of millions- and what makes her so is the fact she wears her crown proudly by owning it- her life, her experience – and she does so by openly sharing the real, the raw and the beautiful. She doesn’t have to sugar coat anything to create some imperfect ideal. It just is. And she’s a fantastic mommy blogger because of it. Letting people catch a glimpse into the human experience isn’t so bad, though haters will tell you otherwise, because truthfully, it’s the tiny voices which are loud enough and proud enough like Hall’s that will change lives. Have changed lives. And when you have one human completely normalizing the human experience of whatever it is they’re passionate about because they’re living out loud, it will encourage another human to do the same for their small corner of the universe, and on and on goes the cycle of inspiration. Might I suggest that if you’re a crochet afficianado you open an Etsy shop and expound on your love of yarn. If you’re a musician – build a Youtube fanbase. If you collect obscure coins from historical eras I can’t pronounce, post your finds on social media. And even if you’re a Divorcee, yes, elucidate on the virtues of legal separations because how many other people are sitting in crappy relationships wondering about whether they should leave? And how many people are curious about what it’s like to slip stitch? And how many people are air guitaring in their showers when they could have a legit audience? 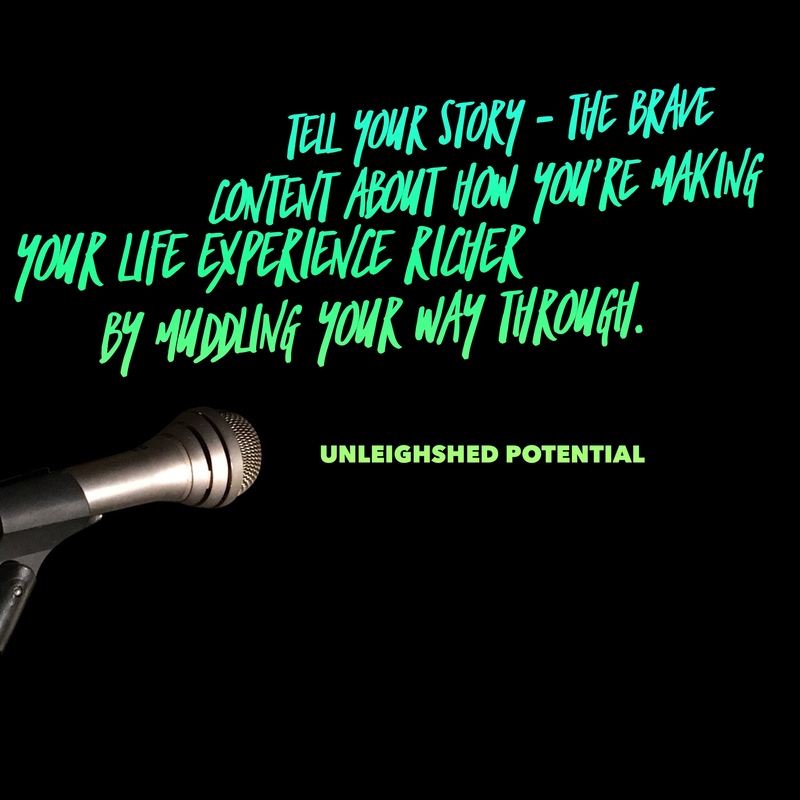 When you tell your story – the brave content about how you’re making your life experience richer by muddling your way through- whether it’s with before and after pics, sound bites or words of wisdom- you’re encouraging others to to be ferociously awesome too. And the more awe-inducing, inspiringly amazing stuff that can filter into the collective human experience, the more it will multiply, and what could be more beautiful than that? Speak your truth and speak it clearly. Always focus on the stuff that is real and true for you because authenticity is magnetic. Find a platform you’re comfortable with which will allow you to express your genuine self. This can be in your book club, on social media or in the gym locker room. Whatever you choose, make sure it aligns with who you are and what you’re all about. Be you, always. Quietly or loudly, don’t ever hide who you truly are from this world.